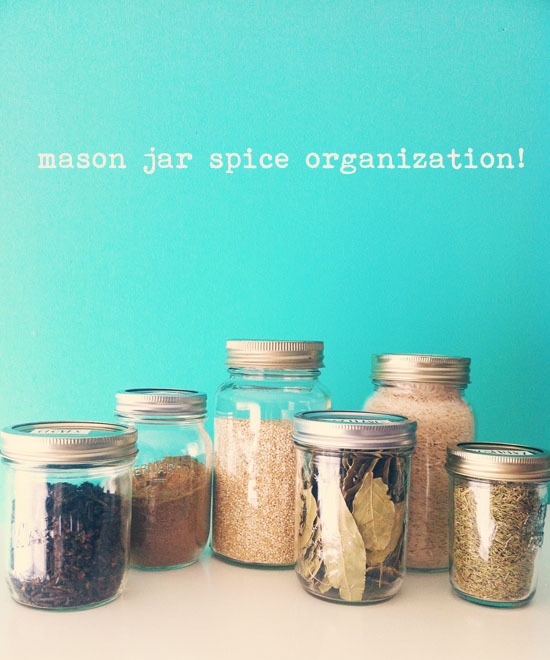 Oh So Lovely Vintage: Organization idea: Mason jar spices. 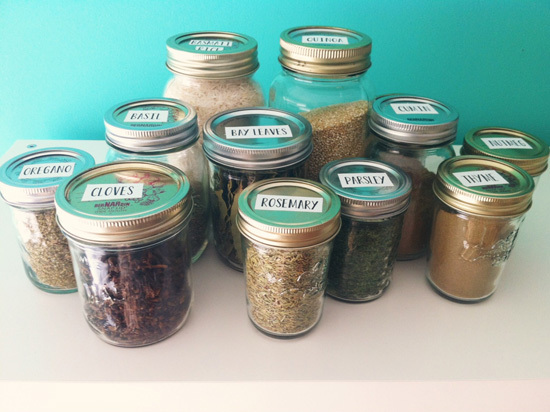 Organization idea: Mason jar spices. There is something about the start of a new year that gets me feeling so motivated. I have finally started tackling those pesky jobs that have been put on the back burner and saved for a rainy (or snowy) day. Well, the snow has been falling and the wind has been howling, so I figured what a perfect time to start organizing my kitchen cupboards! I also decided that each weekend I am going to organize one room in my house and this past weekend I started with my kitchen. I don't know about your kitchen, but my pantry and cupboards seem to get pretty outta control very quickly. Before I know it I find myself starring at four Cheerios boxes that are all about 1/8 full and a bunch of random ziploc bags of assorted spices that have been purchased with one specific dish in mind and then once that dish is completed they get tossed to the back of the cupboard and totally forgotten about. Well I finally decided that enough is enough! 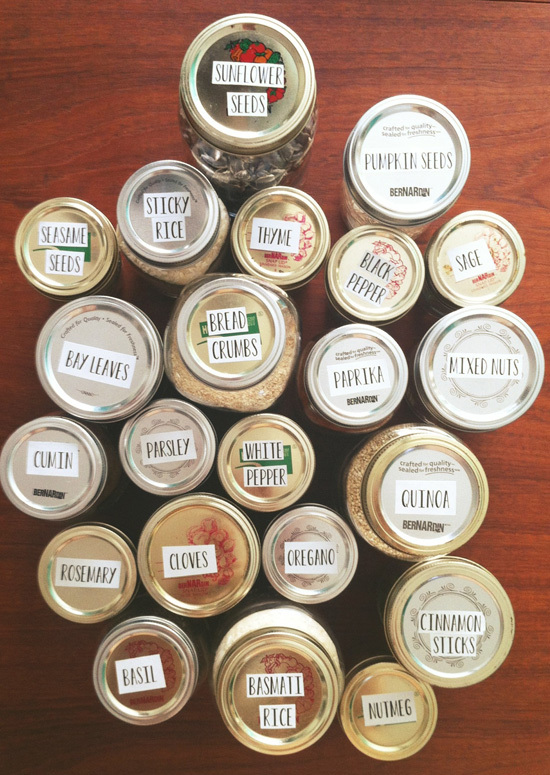 2013 is going to be the year of organization and more experimenting in the kitchen! So I started by giving my kitchen a complete overhaul. I found a cupboard full of empty mason jars that were taking up precious cupboard space so I decided to use them for spice, nut, seed, and pasta storage! By doing this I freed up so much more cupboard space and now all of my cooking ingredients are so much more accessible. Another bonus? They look pretty darn cute. Definitely a step up from my stash of random ziploc bags. I hope this kick-starts your week and inspires you to venture into tackling some of your rainy day jobs! I love it! When I finally have my own kitchen, I'm so putting all my beans, rice, etc. in jars. It's convenient, and it IS totally cute. Love it! I use jars to store nuts, seeds, and coconut. the labels really bring em together. cute! Oh gosh, those labels on the jars are so adorable! This is such a good idea, organised AND chic! Thats a great way to recycle jars. I love this idea! Those jars really class up the joint! This is such a cute idea!!!! Deff going to need to keep this in mind when I get my own place! Love love love! I'm obsessed with Mason Jars and this is a great way to use them. I love that all the sizes are different and non-uniform. Very cute! And what a great way to re-use mason jars. All original content © 2010-2013 Oh So Lovely Vintage. Theme images by Ollustrator. Powered by Blogger.